Grandma In The Apple Tree was originally written by Austrian writer, Mira Lobe. An award winning book of 1965 Austrian Children Book Prize, this story has since been translated into 26 different languages. It has been around for 40 over year. 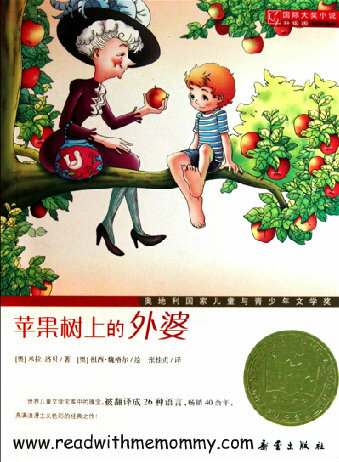 Note: We would recommend this novel for children who has achieved an intermediate to advance level of Chinese. 134 pages. Available in paperback, simplified Chinese. No coloured pictures as this is a short novel. Almost all children have a grandmother. Unlike the other children, the little hero Andy did not. This made him rather upset. One day, a grandmother fell from the sky, and landed on the apple tree. The new grandmother spent a lot of time with him: to the amusement park, to cover wild horses, out to the sea for an adventure, etc. She is always full of the boldest ideas of what to do. One day, his neighbor's grandmother moved in. She had rheumatism and as such, her movement were restricted. Little Andy helped her with a lot of chores, shopping, gardening, cleaning and so on. Grandma also taught Andy to bake cake, and made him new clothes. In the process of helping Grandma, Andy felt grown up. People around him started to change their opinion of him. This made him much happier. The gist of the story is that we had to help others to make ourselves happier. The grandma in the apple tree is a figment of his imagination but they had taught him to care and love others in many many ways.